that I would call myself a soccer mom. Alas, here I am, soccer practice two nights a week and a game on Saturday. But I still can't seem to utter the phrase. It's denial, I know it is. I work all week and drive my 5 year old to practice on Wednesday and Friday night. Yes, Friday night! If that just doesn't scream "suburban normal" I don't know what does. So, on Wednesday night at 6:00 PM I pull out my work in progress, a lacy knee-high sock. I am knitting along and thinking, "Okay, I can do this. One and half hours of free knitting time. Brilliant! No interruptions, just full immersion in K1, P2, YO and K2tog. I am amazed at myself. I have always been extremely resourceful in strange situations. K1, P2, YO, K2tog. I just want to scream. I look at all the other moms and think they want to scream too. Maybe we will start a circle. A soccer mom knitting circle. A soccer mom knitting coven. We will knit socks for the team and a banner for the games. We will stitch torn soccer balls and repair goal nets (how pagan). This class was a smattering of the many techniques involved in dyeing with plant dyes. Day one we weighed, washed and mordanted yarn and fiber. The morning of day two involved handpainting with fustic, lac, logwood and madder. Before lunch we warmed the indigo pot and did some overdyeing with indigo and fustic for a wonderful green hue. We ended our day with some immersion dyeing with madder, fustic, logwood and lac. The final product: A wonderful spectrum of color. Many thanks to Donna and Trish for creating such juicy yarn! Is a great mix of greens, blues and purples. 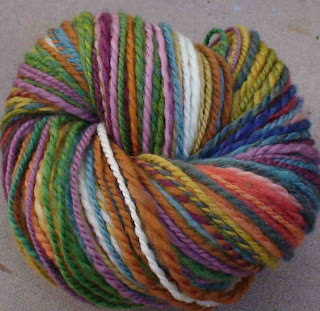 The yarn is dyed with natural plant dyes and knits up in a striped pattern. I love knitting with this yarn. These skeins are 100% Superwash Merino and one of a kind. Lots of yellow, pink, green and orange. 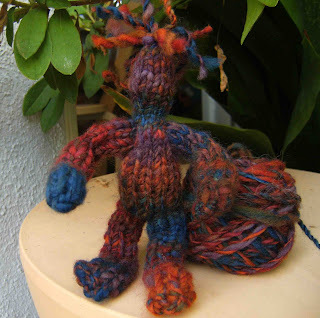 I love dyeing with Madder root and Fustic to get great orange and mustard colors. Again, this is one of kind. 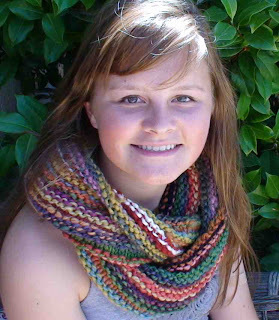 Nicole is introducing this beautiful cowl knitted with one skein of this multi-colored yarn. All multi-colored skeins come with this pattern: Amanda's Simple Striped Scarf. Knitting this cowl is fun and easy. I completed it in about two or three hours. I have always wanted a sister! 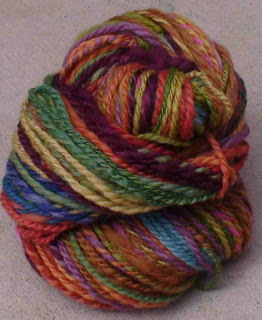 Let me introduce this sweet sister spun from hand-dyed Targhee. She was spun on my new hi-low Schacht Spindle and knitted on #2 needles. Pattern provided by The Natural Knitter. After six years of production spinning on my Schacht Matchless, I have a renewed spirit for spindle spinning. Sister, I am eternally grateful!